At the end of March, I wrote, for The Register, Fighting torture with copyright - Moral musos work to rule about the idea first expressed by Clive Stafford Smith for musicians to use copyright law to possibly achieve more for the human rights of many than human right laws have so far. The story has been picked up by others with a couple interesting twists. Roger Parloff in the Legal Pad at CNN Money investigates whether torture is fair use in the context of copyright law. He takes at heart whether songwriters and music publishers can increase their income thanks to the US army as ‘[m]usic-as-torture seems to offer rare growth potential in an industry otherwise in distress’. Issues being explored include whether use of music in torture constitutes a public performance. For this entry, Parloff consulted William Patry, Senior Copyright Counsel at Google and the author of a treatise on copyright law (and of the The Patry Copyright Blog), professor Jane Ginsburg of Columbia Law School, and Fred Koenigsberg of White & Case and ASCAP's general counsel. Guillaume Champeau on French site Ratiatum asks what if the US army was to buy the music labels? It would solve the copyright infringement issue (and the financial difficulties of some labels). If music is a weapon for war, then maybe it should belong to the army. In the same article, I also wrote about Mark Thomas' mass lone demonstrations (MLD) to undermine Section 132 of the Serious Organised Crime and Police Act 2005 (SOCPA) that outlaws protests without police permission in a designated area within a 1 km straight line from the central part of Parliament Square. The day it was published happened to be the third Wednesday of March and that evening I was in Parliament Square. ‘We understand from the Commissioner of the Metropolitan Police that during the period 1 August 2005 to December 2006 1,379 demonstrations have taken place [in the SOCPA zone] with an authorisation’ according to the Home Office. 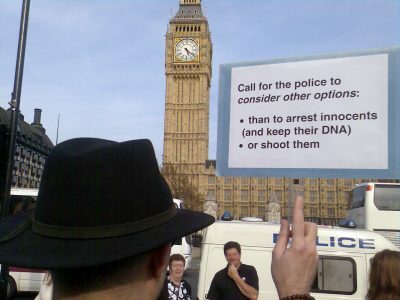 On 2007-04-05, Mark Thomas and a group of regulars at the MLD brought 1,184 requests for demonstrations to Charing Cross police station; the demos will take place on Saturday 2007-04-21. The aim is for people to carry out 20 demos each in the SOCPA zone in one day and to get as many people as possible to do so. To participate, you have until 2007-04-15 10.30am to get your forms in. The regular MLD scheduled for the third Wednesday of the month, is on 2007-04-18 this month. As if Section 132 was not enough of a threat to anyone who wants to be heard by his or her Member of Parliament and Lords, on 2007-05-012007-06-01 the Palace of Westminster and Portcullis House Site will be added among the new sites designated under Section 128 (offence of trespassing on designated site) of the same SOCPA. Come MayJune, attending an event in a Committee Room or meeting your MP in Portcullis House can land in you in jail for up to 51 weeks. 2007-04-28 EDITED TO ADD: The Morning Star picks up on the story and Michal Boncza writes The new torture, published in the 2007-04-28 edition. 2007-04-10 EDITED TO CORRECT: different documents have different start dates for the additions to S.128. It seems that June is the correct commencement date. At the House of Lords debate on Police: DNA Database on the 2007-03-08, Baroness Scotland of Asthal (Minister of State, Home Office) stated that “[t]here were nearly 3.8 million persons on the DNA database as at the end of January 2007”, confirmed that “each sample is kept on the database indefinitely” and explained “we should be clear that negotiations on the Prum treaty have not been completed” (the Prum treaty is a European treaty, which gives European member states direct access to national DNA records). vi. The Communications Service Providers (CSPs) are very important in this process and their staff do essential work. They are very co-operative and dedicated. I talk to them regularly and they are totally opposed to the concept of intercept being admissible in Court. The present regime provides a high degree of protection to the CSPs and particularly to those members of their staff who work in this sensitive field, and their strong co-operation referred to could easily be undermined. Here again, I think that it is essential for people holding views on this subject to talk to the CSPs, and to listen to what they say, and understand the basis of their strong opposition to any change in the present law. Q21 Nia Griffith: You mention in your annual report that communication service providers are strongly opposed to intercept being admissible in court. Can you tell us why that is and should their agreement be a precondition to relaxing the ban? Is the main issue regarding use of intercepts in court really that it's not good for business if we, the public, know that our calls are passed to NTAC, GCHQ or a similar agency?